A prosecutor accusing Argentinian President Cristina Kirchner of covering-up Iran’s suspected role in a deadly Jewish center attack in 1994, has been found dead in his apartment hours before he was set to testify in front of the national Congress. 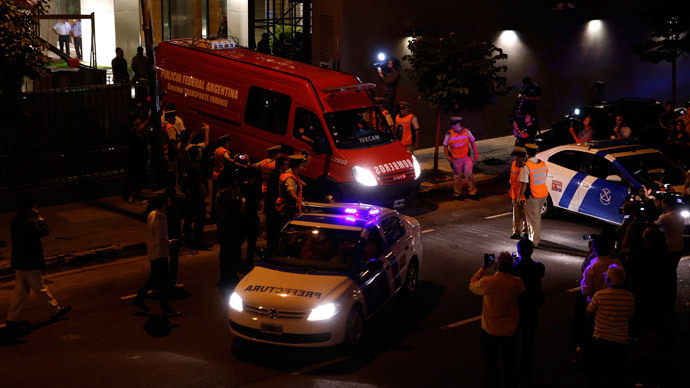 “Alberto Nisman was found dead on Sunday night in his flat on the 13th floor of the tower Le Parc, in the Buenos Aires district of Puerto Madero,” the Argentinian security ministry said in a statement released Sunday night. According to the ministry statement, Nisman’s guards informed their superior that he had not been answering their calls. Late Sunday night, Nisman’s mother entered his apartment with the help of a locksmith, as the door was locked from the other side, and found her son’s body in a pool of blood. A gun was found near his body. “We can confirm that it was a gunshot wound, 22 caliber,” Viviana Fein, federal prosecutor, told Argentine news agency Telam. “In the coming days we will determine the cause of death with an autopsy.” However, it is too early to say what exactly has happened, she added. The prosecutor collected a 300-page file, which he based on wiretaps. Speaking in front of court last week, Nisman accused Argentinian President Cristina Fernandez de Kirchner and Foreign Minister Hector Timerman of covering up Iran’s suspected involvement in the attack. According to Nisman’s files, the president and Foreign Minister tried not to incriminate the Iranian officials in order to promote good trade relations between the two countries. “So, to clear the obstacle, and here is the criminal [aspect], the President [Cristina Fernandez de Kirchner] ordered to divert the investigation, abandoning years of a legitimate demand of justice and sought to free the Iranian imputed [in the case] from all suspicions, contradicting their proved ties with the attack. She decided to fabricate ‘the innocence of Iran’,” Nisman said as cited by the Buenos Aires Herald. The prosecutor addressed a federal judge in order to gain permission to question the president concerning the case which remains unsolved. Nisman’s allegations caused a lot of indignation in the country. He reportedly received death threats by phone and email. The Prime Minister Jorge Capitanich called Nisman’s allegations “crazy, absurd, illogical, irrational, ridiculous, unconstitutional.” The judge in charge of the investigation criticized Nisman for initiating an investigation without judicial control. The prosecutor, appointed in 1994 by the president Nestor Kirchner to investigate the bombing in Buenos Aires on the same year, has been expected to testify in front of lawmakers behind closed doors on Monday. In 2013 the president Kirschner tried to create a special joint commission of Argentina and Iran to investigate the crime, however the court did not allow it. The explosion in the Jewish community center in Buenos Aires in 1994 killed 85 people and wounded hundreds of others. An Argentinian Court accused Iran of sponsoring the attack but Iran declined the accusation.